Makayla Hammons (left) of Annapolis, Md., and Jackie Junta of Stoneham were two hopefuls at the “American Idol” auditions on Friday. 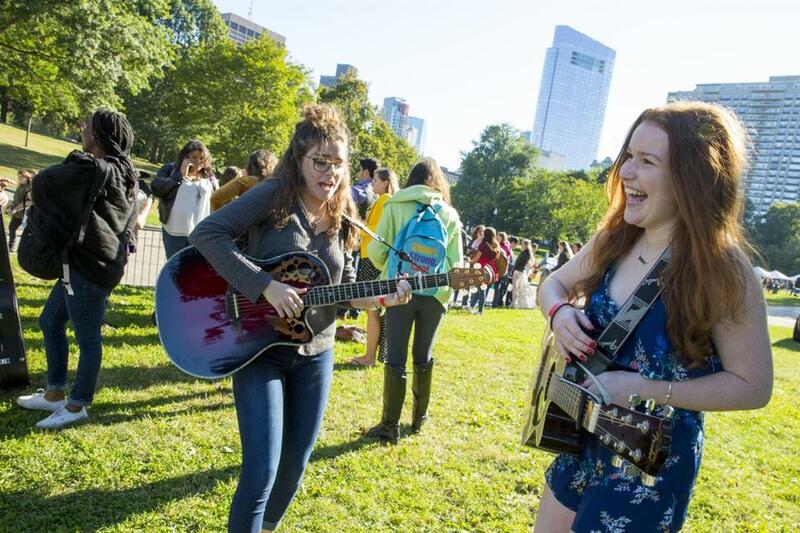 People wandering through Boston Common Friday may have felt like they were witnessing an episode of “American Idol” — and they sort of were. The talent show, which Fox canceled last year after 15 seasons, is coming back on ABC in 2018 and producers are already auditioning prospective contestants. Friday, the “American Idol” bus pulled onto the Common, where hundreds of hopefuls showed up to sing their hearts out. 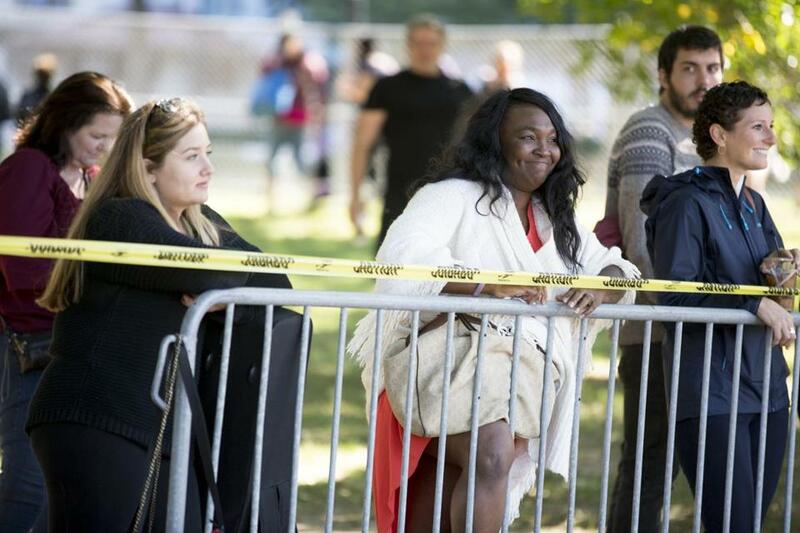 The line formed early — producers were on site at 4:30 a.m. — and streams of wannabe stars, some nervously toting guitars, waited to do their best rendition of Adele or Whitney Houston or, in some cases, showcase a song of their own. There were no celebrity judges there — Katy Perry’s the only one announced so far by the network and she definitely was not sitting at a card table critiquing the crooners Friday — but that didn’t matter to the teens and 20-somethings hoping to be the next Taylor Hicks or Kelly Clarkson. 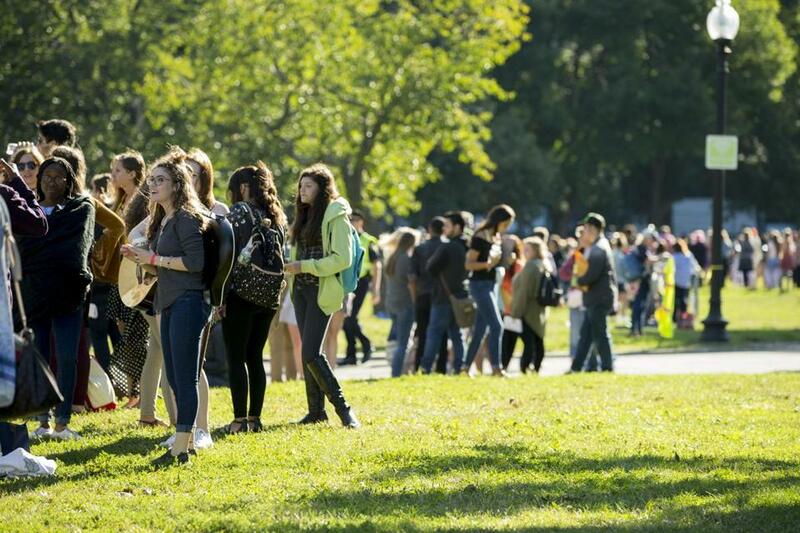 The line of “American Idol” wannabes grew quite long on Boston Common Friday. “I’m a little nervous, yeah, but que sera sera,” said Norrris. That was the general vibe among those who showed up to audition: It’s nerve-racking, but what’s the worst that could happen? Take Meg Paton. The 21-year-old from Dedham has a stellar voice, but she’s never — like, never — sung in front of people. Still, there she was standing in line. The song Paton chose to perform was Etta James’s sultry “At Last.” As she waited her turn, Paton admitted she was terrified, but said it helped to be surrounded by so many people trying to do the same thing. Theresa Coney (center) of Brockton watched as her 15-year-old daughter, Kennedy Campbell, was cheered by people waiting in line. Most performers were sent home with a smile: Thanks but no thanks. But some, like Josh Hollin, who flew to Boston from Boca Raton, Fla., were given a golden ticket that gets them though to the next round. Berklee student Chad Michael Jervis also made it through, wowing a producer with his rendition of Rihanna’s “Love on the Brain,” which he sung while strumming an acoustic guitar. The 22-year-old Jervis said he used to watch “American Idol” and admired winners Ruben Studdard and Adam Lambert, in particular. Conspicuously, Jervis was wearing a black shirt, black pants, and a black hat. “When I’m performing, I like to look the part,” he said.